The main attraction for me was the absence of foaming and stuff like parabens, sodium laureth sulphate and something called phthalates. The blurb on the back says “Tested on Film Stars, not Animals” – but it doesn’t say which film stars were strapped into a harness and had shampoo dripped into their eyeballs, but I enjoyed making a list of potential testees. Smith gets extra brownie points for natural, earth-friendly ingredients and local manufacture (well, Sussex is fairly local…). Her products also carry certification from the Vegan Society. 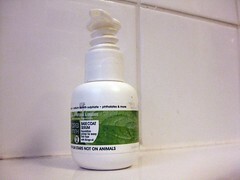 The shampoo contains five yeast extracts and extract of bamboo, plus tea-tree oil and mint. The conditioner has something called Squalane which is derived from avocado and olive oil. Combined with more yeast extracts and marine algae, the conditioner claims to provide with essential minerals and bind moisture to the hair shaft. Both shampoo and conditioners come in circular 250ml bottles that fit very nicely on the edge of the bath. To use the shampoo, rub a good-sized squidge into wet hair and leave in for a few minutes. 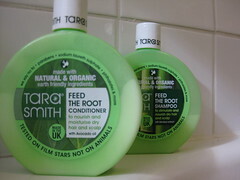 The shampoo is suitably rich-textured and smells deliciously minty, like an After Eight. After about 30 seconds your scalp begins to tingle slightly. This, apparently, is the shampoo At Work, according to the label. With no parabens or foaming agents, there isn’t much in the way of lather, but it rinses out easily anyway. The label recommends a second shampoo, but I don’t think that makes much of a difference, other than more bubbles the second time around. Squeeze-dry your hair and apply the conditioner in the usual way. The conditioner felt quite light, compared with similar products, but it smelled utterly delicious and worked easily into the hair, leaving no icky residue on your hands. Again, you feel the minty tingle after a few seconds. Rinse out the conditioner after leaving it in for five minutes and style as usual. After the wash and condition my usually coarse, wiry (greying) hair actually felt quite silky. This doesn’t usually happen unless I’ve applied half a tonne of Kiehls conditioning treatment and slept with my head in a plastic bag. To be on the safe side, I applied a small dollop of Tara Smith’s base coat primer before blow-drying and tonging the hair into some semblance of normality. The primer helps to protect the hair from heat treatments, and it comes with a clever little all-in-one squishy pump. One pump is all you need for shortish hair with the texture and manageability of a moody Brillo pad. I really wanted to try the root shampoo and conditioner but my local Tesco (which had it for only £2.50) only had the curly and big baby ones so this will definitely be next to try on my list. Has anyone tried the Curly one? I'm trying to figure out which one would work best. I have long, thick, curly hair which always dry. I can take or leave shampoo and hair stuff in general, but this is a very thorough and informative post – I may have to investigate further, not as lame as it sounds because I really am not that into hair stuff, so thankyou very much.